Garbage front woman Shirley Manson has been selected by Britain's NME to receive this year's Icon Award. The honor will be presented on February 14 at the O2 Academy in Brixton. Liam Gallagher is also being honored with the Godlike Genius Award. NME Editor-in-chief Mike Williams said "Shirley Manson first appeared on the cover of NME way back in March 1996. 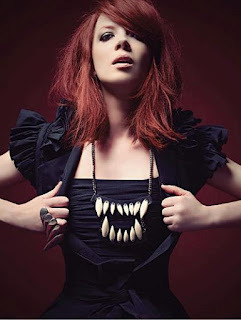 Back then, her attitude, voice and general badassness made Garbage one of the most visceral and important bands of the era – and she’s as outspoken and inspirational to this day. Garbage gave us some of the defining singles of the 90s, and Shirley set a template for being a fearless straight-talker that has influenced countless acts and millions of fans since. It’s our delight to officially honor her as an NME Icon." Manson said "I am quite shocked but delighted to be recognized by NME with this award. I read it religiously as a young teen and well into adulthood, back when it was still a broadsheet, learning so much between its pages about music and the trailblazing artists who filled its pages. I will always be grateful for their support in being one of the first British publications to help break Garbage back in 1995 and I still use the website as an excellent resource for discovering new talent. So yeah…. I’m pretty chuffed about it."